When I started my first blog, I was looking for a way to spread the word about it with this grassroots, guerilla marketing approach. I had some free business cards made up using a cookie cutter template from an online printer, and then sprinkled them around the city, pinning them to every bulletin board in a 25 mile radius. And then one day, I walked past a bulletin board and my heart sang and danced. THE WORD WAS OUT! Someone had shared my business card and believed in my blog enough to post this around. Sure enough, it was someone else’s business card, using the same cookie cutter template that I’d used from that online printing site. Your brand is you… it is the appearance of your business (logo, website, social media presence), it’s the colours, fonts and words you use, it’s your uniforms, your service… it is everything that promotes you in the market. Yes, it needs to be professional, and yes it needs to be consistent, but most importantly: IT NEEDS TO BE YOURS. How can you stand up and declare “HERE I AM” with the same cookie cutter marketing templates that are being used by thousands of other companies, in your area and beyond? 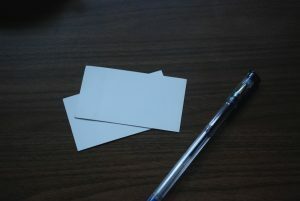 And trust me… this online printer will happily sell you the matching address labels, note pads, pens, etc – but so what? If the look and feel are not yours and yours alone, then you aren’t making a statement at all.